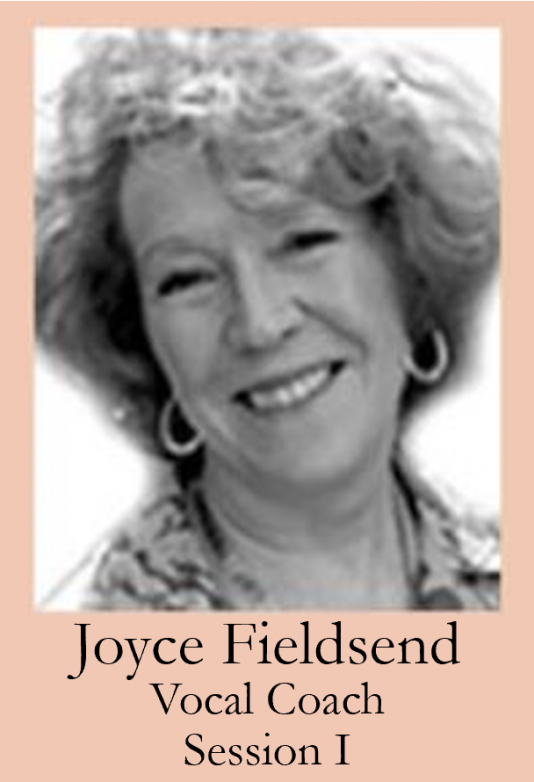 Joyce Fieldsend began her career a a full-time repetiteur for Scottish Opera where she developed a large and varied repertoire and played many keyboard and harpsichord continuo parts on five European tours. During this time, she was also a guest coach with the New Israeli Opera and Assistant conductor for the Virginia Opera Association American Premiere and recording of Thea Musgrave’s opera, Queen of Scots. From 1984 until 2000, Joyce was a permanent member of the Glyndeborne Festival Opera and Glyndebourne Touring Opera; she was Chief Coach on their videos of Death in Venice and Ermione and played the harpsicord continuo on their video of La Clemenza di Tito. Other interesting assignments have included Attila for Opera North, Tancredi and the Wexford Festival, Der Rosenkavalier, Tosca and Semele in Hong Kong: Jenufa in Edmonton: Rigoletto in Dallas: La Calisto, I Pagliacci and Cavalleria Rusticana for the Glimmerglass Opera Festival and Katya Kabanova at the Wellington International Arts Festival in New Zealand. Joyce joined the San Francisco Opera Music Staff in 1992 where she was Senior Coach for over thirty operas before leaving to settle in Italy in 2002. Among these productions it is worth mentioning the world premiere in 1998 of A Streetcar Named Desire by Sir André Previn. In 2001 she played her first Der Ring des Nibelungen for the Seattle Opera. Some of Joyce’s most recent engagements have included Die Koenigskinder, Simon Boccanegra, Elettra and Der Fliegende Hollaender for the San Carlo theatre in Naples and Capriccio, Katya Kabanova, The Mikado, A Midsummer Night’s Dream, Der Freischuetz, Le Domino Noir, Les Pecheurs de Perles, Daphne, a Petrassi double-bill, L’Olimpiade by Gluppi with Andrea Marcon and many others for the Fenice theatre in Venice. She also collaborated regularly with Maestro Jeffery Tate with whom she has done Die Walkuere and Siegfried at the Fenice and Candide at the San Carlo. She retuned to Naples to assist Maestro Tate on Parsifal. Her wide experience and knowledge of the operas of Benjamin Britten and Janacek have made her a most welcome guest in the preparation of these works in some of the most important theatres in the world. However, she is equally well-known in practically every aspect of the operatic repertoire ranging from Monteverdi to newly-commissioned pieces and is particularly enjoying exploring and coaching the Italian bel canto repertoire. Joyce loves working with young artists and has been Guest Professor at the Royal Scottish Academy, The Academy for the Performing Arts in Hong Kong, The Royal College and the Guildhall School of Music and Drama in London, the Britten and Pears School in Aldeburgh, The National Opera Studio in London, the Cardiff International Academy of Voice in Wales and Les Jeunes Voix du Rhin in Colmar. Joyce has also been on the Faculty of the International Vocal Arts Institute in Tel Aviv and Montreal and goes to Mexico in July for the second time to work for Artescenica with your Mexican artists in Saltillo. She also takes great pleasure in accompanying recitals, playing chamber music and coaching singers in her home in Venice.